The Pascoag Utility District was incorporated by a special act of the Rhode Island General Assembly. A quasi-municipal utility, Pascoag provides electricity and water on a “not for profit” basis. Our service for Pascoag included creating an easy way for customers to access their accounts and pay bills. 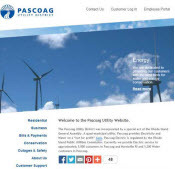 Pascoag Utility District’s responsive website design features a “pay my bill” button that simply directs customers to where they want to go. Images and content portray Pascoag as a reliable resource for their over 5,000 loyal customers. The website also features an interactive outage map tool that allows visitors and staff to visually track any local outages. The website is fully responsive and features a content management system, employee portal, customer outage map and integration with their bill payment service provider allowing customers to make payments online. Boston Web Designers specializes in web design for utility and power companies. Utility web design is a unique niche for our firm and clients include: Con Edison, Honeywell, Baltimore Gas and Electric (BGE), Pascoag Utility District, BUILD IT GREEN California, Indiana Michigan Power, American Electric Power, Pacific Gas and Electric Company, a subsidiary of PG&E Corporation, Brant Energy, Inc, The Jordon Cove Energy Project, La Capra Associates, Inc., Ambient Corp. Applications include power outage maps, bill payment, employee portal and online content and management.